Total cash income on portfolio investment for March from dividends and swing trades was +1.37% and has totaled +6.24% for the past 5 months, 50% above my 10% annual goal. Dividend income for March was $737, an increase from February. Closed-end funds contributed 81.4% of dividends. Dividends contributed 37.1% of total portfolio income. Swing trade income for March was $1,247. I closed 8 profitable swing trades for a total net gain of +8.96% (average 30 days). I entered 13 new swing trades. After recovering nearly 80% of the fall 2018 bear market decline, the SPY has stalled in March. Work on the Caldaro Objective Elliott Wave pattern for the SPX has resumed. Welcome to my March update for my Green Dot Portfolio, a small self-directed retirement portfolio created in a Roth IRA trading account. March was the fifth month of my second year for my portfolio, and it was overall my second most profitable since portfolio inception. This year my goal is to achieve 10%+ in total cash income, using high-yield dividend investments (closed end funds, REITs, and dividend growth stocks), as well as swing- and position-trading of stocks, ETFs, and option premiums. Readers of my previous updates know that I use the broad market index, the SPDR S&P 500 Trust ETF (SPY), to represent the overall price pattern and trend of the markets. In February, the market continued to recover from the bear market selloff in fall of 2018. Using a Fibonacci retracement sequence, the SPY had recovered about 78.6% of the 2018 bear. A month later, the SPY hasn't made much additional progress. 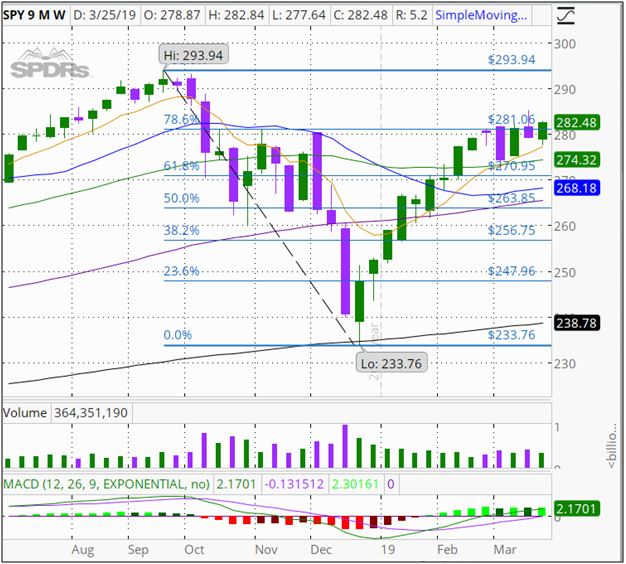 As the weekly chart below shows, the SPY is still finding resistance at this important level despite being in an uptrend. 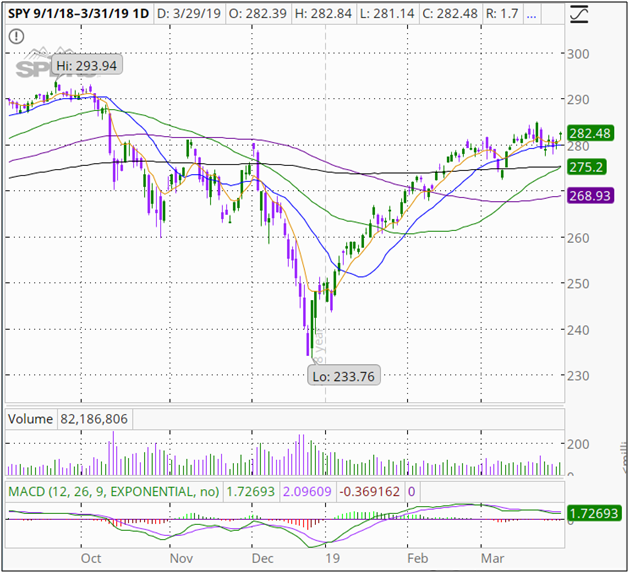 The daily chart for the SPY below shows that while the index is above the 20, 50, 100 and 200 day moving averages, the SPY is increasingly unable to advance above the 20 day MA (blue line). Also, volume has been weak. I've been taught that bull markets typically occur with strong price action by the financial sector as well as small caps. However, both of these are lagging at this time. The chart below, left, is for the Financial Select Sector SPDR Fund (XLF) and the chart, right, is for the iShares Russell 2000 ETF (IWM). Both indexes have clearly retreated from the highs reached earlier in March. I've heard commentary that the market has priced in expectations of a trade deal with China and an interest rate cut sometime in 2019. Should either of these not materalize, this uptrend could be quickly reversed with a change in sentiment. For some time now I have also covered the quantitative Elliott Wave pattern for the SPY by Tony Caldaro (Objective Elliot Wave). 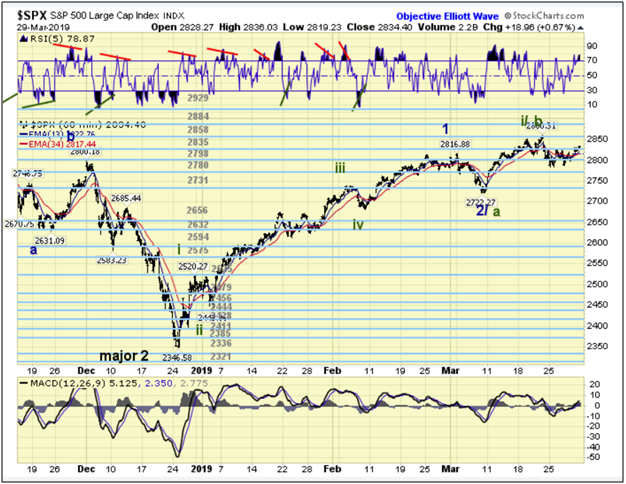 Since the passing of Caldaro in February, the "OEW Group" has resumed the work of providing analysis of the SPX pattern using Caldaro's methodology. However, there is no update for the week that just ended on 3/29, but the Group has updated the major charts. For some context, according to Caldaro the 2018 bear market (Major 2 in a longer Primary III bull market) completed in late December, and the 2019 rebound is the beginning of a Major 3 (up) wave. For weeks now, two possible patterns for the SPY have emerged within the Major 3. These are shown on the hourly chart below. One scenario is that the pullback in early March completed Minor 2 down and that Minor 3 up has been underway since. But this decline is far shallower than Caldaro first suggested. The second alternative is that the early March pullback is but the first part of a 3-wave a-b-c (zig-zag) Minor 2 down, which overall would be a larger decline. I have been expecting that the larger pullback would occur, and have placed several leveraged index ETF trades that would profit from a decline. These include those for the S&P 500 (SPXS), that Nasdaq 100 (SQQQ), and Semiconductors (SOXS). In March, I continued to open and close swing trades as the market rebounded from the late December 2018 low. As in February, climbing prices left me hesitant to add aggressively to core income positions such as higher-yielding closed end funds or REITs, especially as many REITs are very overbought. This split is never equal on a dollar cost basis from month to month, and the mix within each group changes over time as well. My overall strategy is to generate a fairly high level of slowly-growing dividend income that will generate between 1/2 and 2/3 of my total annual return goal, with swing trades making up the remainder of the goal returns. In recent months, I've been heavier on swing trades as the market is more favorable to long trades. Compared to February, I reduced the number of CEFs from 18 to 16, and I increased the number of income and dividend growth stocks from 5 to 9. 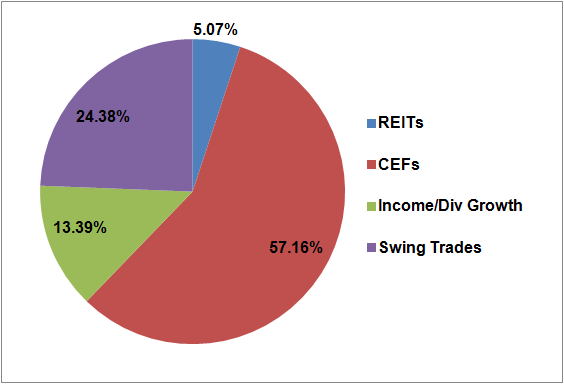 I still have 2 REITs and 16 open swing trades (but many of these are different). The pie chart below shows the percentage of the portfolio investment allocated to these assets at the close of March. The biggest change from February to March in percentage terms is that the income & dividend growth stocks increased from 7.96% to 13.39%, which is similar to the percentage held in January. Swing trades also decreased somewhat, from 63.03% in February to 57.16% in March. I moved out of two of my income positions in March, both closed-end funds. As with other portfolio adjustments, I do not consider that these are swing trades, and the net gains from any share price appreciation are not added as portfolio returns (only the dividends). I typically use proceeds from these sales to add to other existing CEFs and/or to start positions in new income positions. On 3/22, I sold my 100 shares of JH (John Hancock) Preferred Income III (HPS) at $18.73/share. I most recently bought this CEF on 11/26 at $17.18/share. With distributions of $48.88 and the price appreciation, I realized a net gain of $194.85 or +11.3%, with the price gain alone equal to nearly a year of distributions. I like HPS and will add it back to the portfolio when the price comes in, but it was trading at a premium and it was time to take the profits. On 3/25, I sold my 130 shares of Flaherty & Crumrine Total Return Fund (FLC) at $19.60/share. I first bought this CEF in November 2017 and added twice, for an average unit cost of $20.54. While the underlying shares were sold for a loss of -$126.95, I collected distributions of $194.44, for a small net gain of $67.49 (+2.5%). I sold this CEF because it had cut distributions twice since my first purchase (most recent in January), for a total cut of 8.7%. In addition, FLC cut distributions twice before my purchase starting in late 2016, for a total cut of 15.4% in two and a half years. Overall, I felt that this CEF was under-performing. In my Green Dot portfolio, all holdings are subject to review, and I do not by definition or arbitrarily hold any investment "forever." In March, I collected $737 in dividends, in addition to $78 in dividends from swing trades. The 5-month average for this second year is $704. 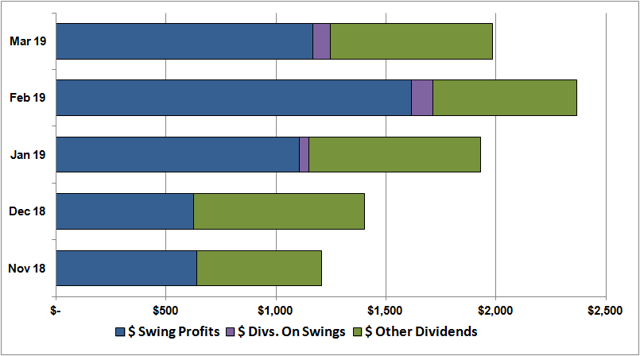 Dividends in March comprised 37.1% of total income compared to the 5-month average of 40.8%. This reflects another month of income dominated from swing trades. 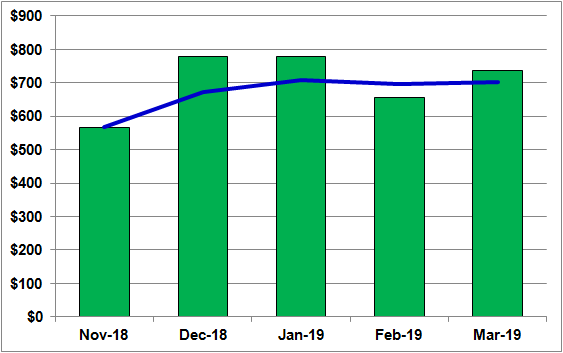 Dividends from CEFs was $600 and comprised 81.4% of dividends this month (excluding dividends from swing trades), which was a bit higher than the 5-month average of $592. Average income from CEFs to date is 84.1%, which is expected given my portfolio concentration in these high-yield investments. Total monthly income from dividends excluding dividends from swing trades for this second year is presented in the chart below. The blue line on the chart is the average monthly dividend income. Total dividend income so far this year is $3,518 and is $3,735 when including dividends on swing trades. Readers of my portfolio articles and blogs know that I really like Closed End Funds for their high-yield distributions. At the close of February, my portfolio included 18 CEFs and now includes 16 in March. 6 of the CEFs (BIT, BGX, RNP, KIO, AOD, DSL) have gained in market value to date over cost, in addition to providing distributions. 7 of the CEFs (HYT, EMD, AWF, RA, JPS, MSD, LDP) have a current loss of market value that is less than the total value of distributions received. 3 of the CEFs (FEO, FAX, FRA) have a market loss that exceeds the total value of distributions received. 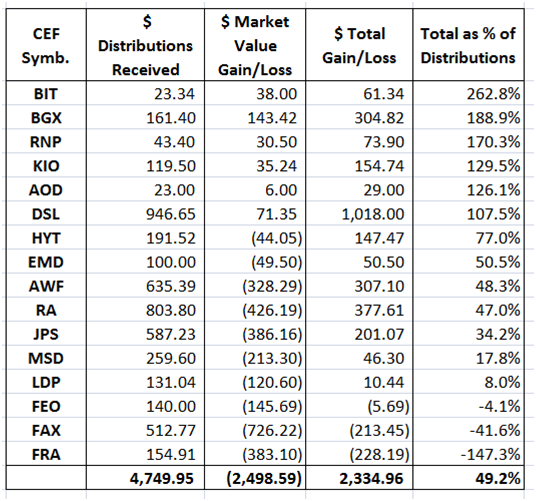 Current total loss for FEO is less than $6, while FAX and FRA are clearly the 2 real losers among these 16 CEFs. Through March, the 16 CEFs have provided a total of $4,750 in distributions and the net loss in market value over costs is currently $2,499, resulting in a net total gain of $2,335. (Source: Table created by author from portfolio data as of March 29). The net gain is only $120 less than for February, but there are now only 3 losing CEFs compared to 6 in February. As expected, with average market prices, the CEFs will continue to improve returns as monthly dividends accumulate. So far in this portfolio, I have not automatically re-invested dividends, preferring instead to "shop around" to deploy proceeds to lower unit cost funds. But given my larger fund balance, I will start to selectively DRIP some of my CEFs. As I mentioned last month, I also take profits on some of my CEFs when they trade at premiums to their Net Asset Values. So overall, my income from CEFs since portfolio inception is much higher than shown above, also due to selling some for other reasons such as under-performance. I have collected $6,933 in total distributions from CEFs. For those new to my monthly updates, I provide detailed information, charts, and my trade logs for swing trades in my weekly blogs for followers. I also have been posting what are, in effect, trade alerts as "updates" for readers of my weekly blogs. I post to the most current weekly blog any trades shortly after I place them. Readers are reminded to do their own due diligence when placing any trades. In March, I closed 8 swing trades for a total net gain of $1,247. These trades included 2 leveraged index ETFs/ETNs and 6 stocks (including 1 penny stock). The average investment was smallish, at $1,740, and the average net gain was also small ($156). The total return including dividends on the swings averaged +8.96% for an average of 30 days in the trade. The table below presents the dates, symbols, names, number of shares, sell prices, percentage gains, and number of days in the trade for these 8 trades. Four of these closed trades were also only opened in March: AMGN, LABD, MCK, and VXXB. I provide details for most of my swing trades in my weekly blogs. Given that these are mostly intended as shorter-term trades, I typically use technical chart levels such as gap fills or potential resistance at moving averages as the basis for my decision to sell any particular stock. Many of the stocks that I sell continue to advance in time, but my objective is to realize frequent, consistent profits, which I deploy to new trades. In March, I added to 3 existing positions (1 stock and 2 leveraged index ETFs) and opened 13 new swing trades, for a total cost of $15,093. These 13 included 1 option premium, 2 index ETF/ETNs, and 10 common stocks. Details about these trades were provided in my weekly blogs, and I present a summary table below showing the date, name, ticker symbol, quantity, and share price for each of these 16 trades. Please be advised that leveraged index funds carry high risk. 3 of the new buys are positions for which I added shares: FRME, SPXS, and SQQQ. 4 of the new buys were also sold in March: AMGN, LABD, MCK, and VXXB. 6 of the new buys were based on research or are at lower entry levels in portfolios that I follow: ACLS, CI, CVS, MSFT, NIO, and PFG. 3 of the new buys were bank stocks that dropped >11% in 3 days due to the recent interest rate inversion: CMA, HBAN, and KEY. I may hold these longer than a typical swing trade, because they generally have 5-year dividend growth rates that are out-pacing their 5-year share price growth rates. For the 5 months of my second year, I have been fortunate to close 42 profitable non-option swing trades for a net gain of $5,066, including $218 in dividends on those trades. This represents an average weighted gain of +7.35% for an average of 34 trading days (+54% annualized). The chart below shows the percentage gains for these non-option swing trades for the second year of my portfolio. Trades closed in March are in blue. The trades closed in March resulted in an increase in the cumulative average investment cost and gains. The average investment cost was $1,642 for all 42 closed trades compared to $1,740 for the 8 trades closed in March, and the average net gain for all 42 trades was $121 compared to $156 for those in March. I did not close any option premium swing trades in March, and my activity for option trades remains slow so far this year. For the first 5 months of my second year, closed swing trades have added $5,337 in cash to my portfolio. The table below (corrected from last month) summarizes the contribution by month of cash income from option and non-option swing trades. Swing trades have provided 60% of my total cash income to date. My Green Dot portfolio generates cash income each month through dividends and profits from swing trades. These are realized gains, or cash that is available for additional investment. In October, I raised my portfolio goal for this second year to a 10%+ annualized gain (average of 0.83%/month). Total returns increased for March, at +1.37%, which was well above those for November and December but lower than for January and February. The total gain for this past 5 months is now +6.24%, and the monthly average is +1.25%. So, for now, I am comfortably ahead of my target for my new 10% goal. This provides a buffer as I do not expect to increase my returns every month, especially from swing trades. The January-February period was one of very strong price growth that may not continue as strongly for the coming months. The chart below of the monthly source of realized cash portfolio profits depicts the data graphically. This compares favorably to the first year of my portfolio, for which only 5 of the 12 months had total cash income >$1,000. The monthly average for that period was $1,063 and for now is $1,771. Data for the first year are provided in my October monthly update article. 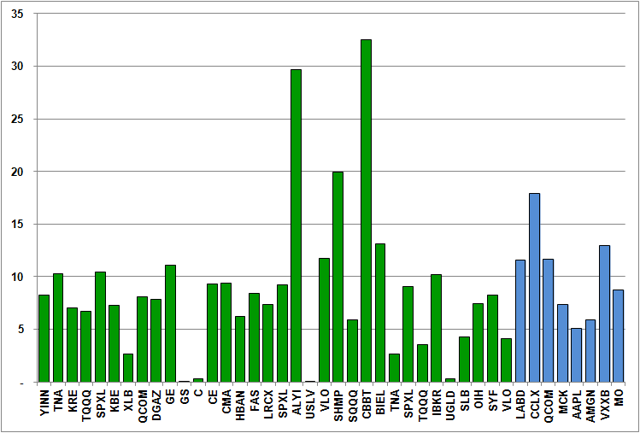 The total current value of all 43 positions in my portfolio at the end of March was -8.28%, a bit higher than for February but about the same as for January. The SPY has still only recovered about 80% of the late 2018 bear market, so I expect that some losses will continue to be reduced. And I still have some longer-standing losing positions such as General Electric (GE), Macquarie Infrastructure (MIC) , and Colony Capital (CLNY) that I can continue to hold for now. While I wait, I'm receiving decent dividends from most of the portfolio, at an average of 8.46% for the 16 CEFs and 4.86% for the 2 REITs and 9 dividend growth stocks. At the close of March, my portfolio consisted of 43 holdings, including 2 option premium swing trades and 2 penny stocks. The table below lists these holdings, including the current number of shares, average unit cost, dividend/distribution yield, and the percentage that they comprise of the overall portfolio investment. At the end of March, the SPY has generally recovered about 80% of the fall bear market decline that resulted in 2018 being a losing year. I was fortunate to out-perform the market during the first year of my portfolio (ended in October), and at this time I am well ahead of my 10% annual cash return goal for my second year. With 60% of my income from swing trading, my portfolio is constantly changing. This is what I do and others can use their own investing and trading approaches. All's good if it works. My costs are relatively low, as I have an active trader discount and often receive many free trades, and I have no taxes on swing trade profits or dividend income, as this portfolio is in a Roth IRA. What I do here may or may not be appropriate for others, so please perform your own due diligence if you follow any of my ideas or trades. I wish readers well with their own endeavors! 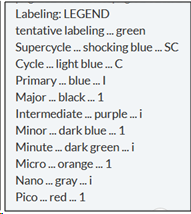 Disclosure: I am/we are long ABBV, ACLS, AOD, AWF, BGX, BIT, CI, CLNY, CMA, CVS, D, DSL, EMD, ERBB, FAX, FDX, FEO, FRA, FRME, FUTL, GE, HBAN, HYT, JPS, KEY, KHC, KIO, LDP, MIC, MSD, MSFT, NIO, PFG, RA, RNP, SKT, SNV, SOXS, SPXS, SQQQ, UCO, WLK, XRX. I wrote this article myself, and it expresses my own opinions. I am not receiving compensation for it (other than from Seeking Alpha). I have no business relationship with any company whose stock is mentioned in this article.